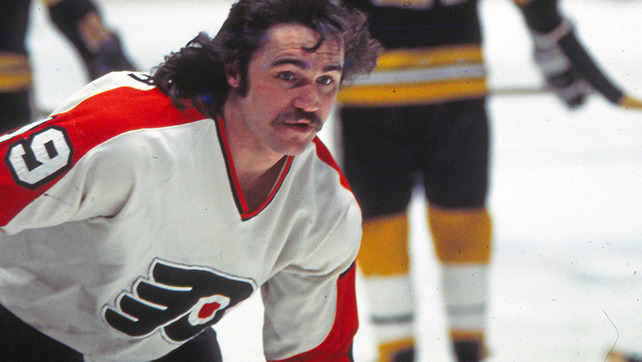 Rick MacLeish, member of the Flyers Stanley Cup championship teams in 1974 and 1975, passed away on Monday at the age of 66. MacLeish spent parts of 12 seasons with the Flyers, including 11 straight from 1970-71 to 1980-81. He accumulated 697 points as a Flyer, which ranks fourth all time in franchise history, while also recording 328 goals (6th in Flyers history) and 369 assists (T-5th in Flyers history) in 741 games (T-6th in Flyers history). MacLeish also ranks second in franchise history with 12 regular season hat tricks, only behind Tim Kerr’s mark of 17. In 1972-73, his first full season in the NHL, he became the Flyers first 50-goal scorer and just the eighth player in NHL history to score 50 goals in a single season. To this day, he is one of six Flyers to ever reach the 50-goal mark (Leach, Barber, Kerr, Recchi & LeClair). MacLeish was also a standout in the Stanley Cup playoffs. He led the Flyers in both goals and points in both of their Stanley Cup Championship runs in 1974 (13 goals & 22 points) and 1975 (11 goals and 20 points). He ranks first all-time in Flyers history with 10 game-winning goals, and scored the game-winning goal in Game 6 of the Stanley Cup Final in a 1-0 victory against the Boston Bruins to claim the Flyers first Stanley Cup title in 1974. MacLeish is tied (with Bill Barber) for the most playoff goals scored in club history with 53, and ranks fourth all-time in Flyers history with 105 points in 108 playoff games. MacLeish was inducted into the Flyers Hall of Fame in its third year of existence on Mar. 22, 1990.